Hard coast – www.muien.nl De Nederlandse website over muien. The Dutch website about RIPS. The definition a hard coast of this website is a sandy coast with concrete or wooden obstacles. Like harbor peers or groynes. 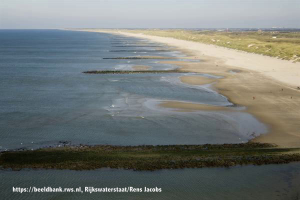 The rip currents at these permanent obstacles are called permanent rip currents. The moments the permanent ripcurremts are active are different compared to the fixed rip currents. For that reason it is important to know with the type of coast you are dealing with. Go on now to permanent rip currents.